Want to make good money while helping others become the best readers they can be? We invite you to join the Rev It Up Reading Affiliate Program. By simply placing our affiliate link or banner on your website, when your visitors purchase the online speed reading course, you’ll earn 25% commission for every course you sell (which when purchased at $199 retail means $49.75 per sale!). If they choose to renew after 90 days ($49 renewal fee), you will receive an additional $12.25. If someone visits your website and clicks through to ours, we maintain a 90 day cookie so if they come back within 90 days to buy, you still get credit for the sale. (Compare this to Amazon that has a 24 hour cookie!) 30 Day Payout We pay commissions (over $100) on the first of every month, 30 days after the commission is earned. If you have earned less than $100, we will await payment until $100 is reached. We can pay via check (US affiliates only) or through PayPal (required for international affiliates). Once approved, you will receive a link to our affiliate center. There will you find your affiliate links and banners needed to get started. Your success is our success so let us know how we can help you. If you don’t have a website yet can market the course through other means, we can provide you with a special coupon code to give to your buyers to use during check out. The coupon tracks back to you and you receive affiliate commissions for it. 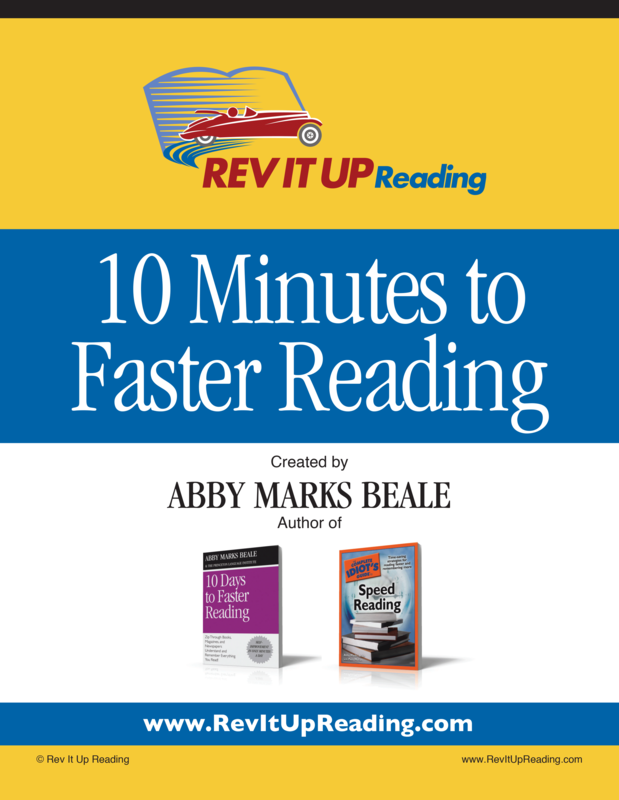 If you need more information, contact us.
. . . AND get Abby’s free eBook , 10 Minutes To Faster Reading, along with a $50 off coupon code to purchase the full version of the Rev it Up Reading Online Speed Reading Course.